“We are … here today to initiate the process which, under the Local Government Act [ Sections 215 and 218E (2)], will begin an inquiry into the merger process and hopefully lead to the demerging of our council,” Mr Hamilton told the crowd. NSW Labor MLC and Local Government spokesman Peter Primrose congratulated the community of Tumbarumba on their efforts and said that what happened in local communities should be a decision for local people. “Can I stress again: our policy is that if communities choose to demerge, that’s a decision for them and they should be allowed to demerge,” Mr Primrose said. 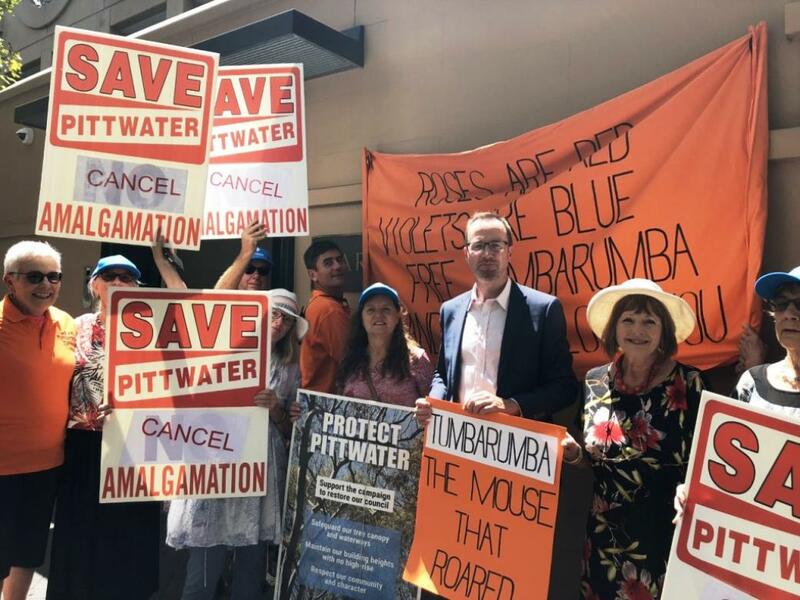 His NSW Greens counterpart David Shoebridge also vowed the party would support other communities such as Pittwater, Leichhardt, Guyra and Gloucester who all wanted to reinstate “genuinely local government”. “The Liberal National government has done a job on Tumbarumba and they won’t be going away until they get their council back,” Mr Shoebridge said. Shooters, Fishers and Farmers Party MLC Robert Brown, also promised the rally that his party would support Labor’s legislation - if it won government - to introduce a plebiscite allowing residents a say on the mergers. “It’s a great effort to see that you’re still prepared to fight,” Mr Brown said. “If you give up the fight, we can’t do anything for you. Mr Brown’s party last year introduced a demerger bill that passed the NSW Upper House but failed in the Legislative Assembly. The Christian Democratic Party completed the roll call of political parties opposed to forced amalgamations, with its Leader Fred Nile calling on the Premier Gladys Berejiklian to “sort this out now”. 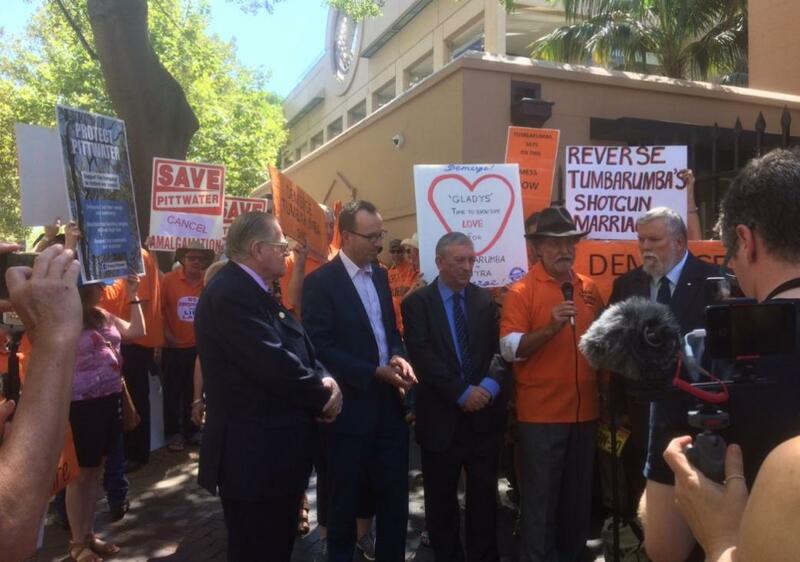 (Left to Right) Christian Democratic Party MLC and Leader Fred Nile; NSW Greens MLC and Local Government spokesman David Shoebridge; NSW Labor MLC and Local Government spokesman Peter Primrose; Save Tumbarumba Shire spokesman Neil Hamilton; and NSW Shooters, Fishers and Farmers MLC Robert Brown. Newport's Bushlink 'From The Crown To The Sea' Paths: Celebrating Over 20 Years Of Community Volunteer Bushcare Results: The pathways wend through the Crown of Newport Reserve, Porter’s Reserve, Attunga Reserve and the Kanimbla Reserve. Includes link to March 2016 Amended Draft of 'North Ward' by NSW Government 'Planner'.